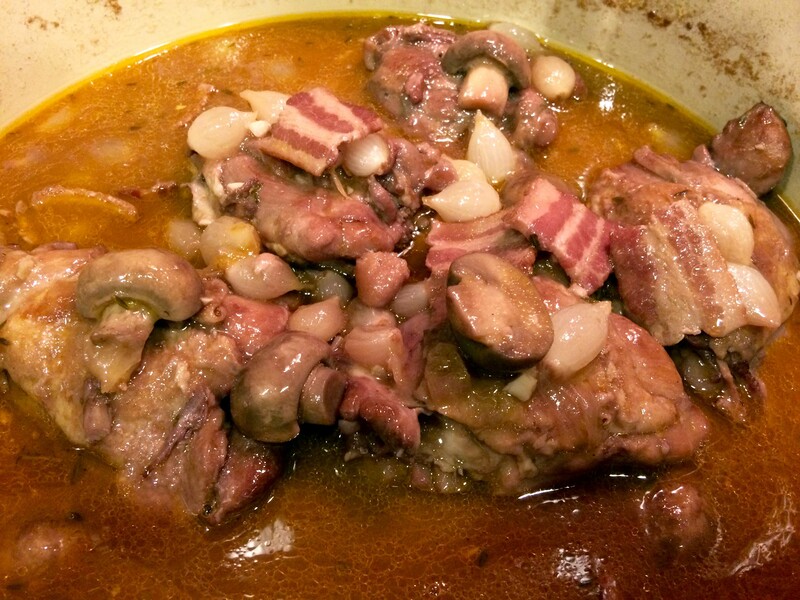 Inspired by a recent post on Diane Darrow’s blog, Another Year in Recipes, I prepared a classic Coq au Vin from a recipe in Julia Child’s tome From Julia Child’s Kitchen. Published in 1975, the book is now 43 years old, something I never considered until I was reading the recipe and noticed that for a dish with 2 1/2 pounds of chicken along with bacon and mushrooms simmered in 2 cups of red wine and the same amount of stock, it called for a minuscule amount of thyme, 1/4 teaspoon. At first I thought this might have been a misprint, but as I thought about it more, I realized that when the book was published fresh thyme was not readily available in most supermarkets. Consequently, her measurement was most likely for dried thyme. No big deal; however, this realization made me think how fortunate we are today to have such an abundant and diverse supply of food items available to us not only in gourmet and fancy-food shops but also in our local supermarkets. I used to live in New York City’s Upper West Side and Chelsea neighborhoods, where finding specialty items was a piece of cake at stores like Zabars, Citarella, Buon Italia, Murray’s Cheese, Manhattan Fruit, and Dickson’s Farmstand Meats, not to mention the famed Union Square Farmers Market. Recently, however, we moved to San Diego. And although we’re lucky to have here a vibrant Little Italy with a couple of well stocked Italian food stores and a wonderful bi-weekly farmers market, for most of my food supplies, I have to rely on my local supermarket. As I walk its aisles, I can find an abundance of high quality fresh produce, a wide variety of fresh herbs, and good selection of imported specialty items. In fact, the store even has its own Murray’s Cheese Shop. I’m not saying that I don’t miss having the plethora of food stores that NYC afforded me, but I do feel pretty lucky that local supermarkets have come such a long way since Julia published the aforementioned book 43 years ago.